Pictures of Ranga pens in Blue and White Swirl premium ebonite will be appreciated. I'm particularly interested in seeing differences in the polished finish vs bakul in this specific ebonite. Thank everyone and anyone for posting your pics! I've just ordered a 3C in Blue and White Swirl polished, and want to be sure I prefer it to the bakul for this ebonite. Mods, please move if this is in the wrong forum. Premium ebonite is best in polished finish. This is Mr. Kandan's recommendation. I've never actually seen a premium ebonite in bakul, but I assume the type of material makes the standard ebonite more adequate to the bakul finish than the premium. Mr. Kandan may possibly explain the technical reasons. As far as colour is concerned, you need to be ready for surprises, one pen is never the same as the other with ebonite, and differences are not just in the part of the rod which is used, and the width of the pen which will eat up some of the material from the rod surface (so the swirl also depends on how deep the turning digs into the rod), but also between different batches of the same ebonite. In any case, here is an 8B in blue white swirl (the other pens are another 8B and a 3C, essentially the 8B and 3/3C are a similar size but the 8B, besides the pointed ends, has an hourglass shaped section). 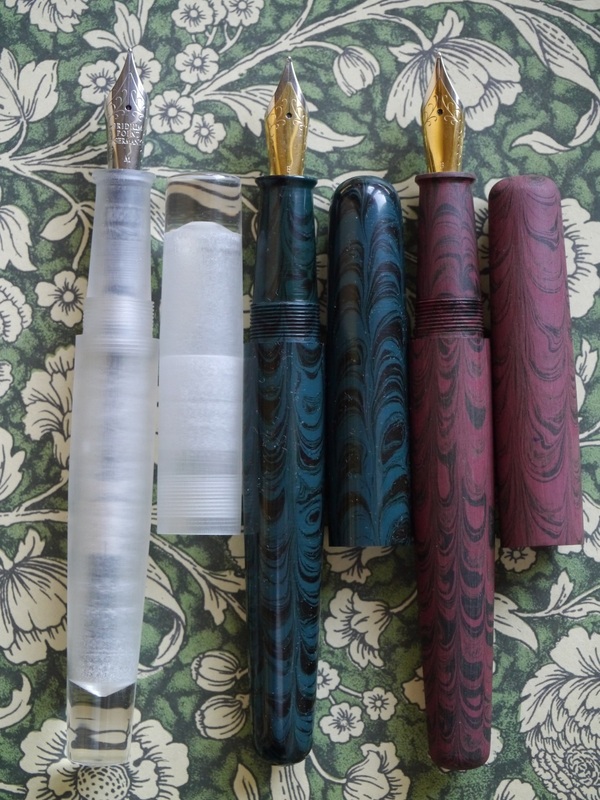 The differences are what make each pen unique. Mailed and Paid in lanstang's name. Ordered 2 Giant Bamboo this time. 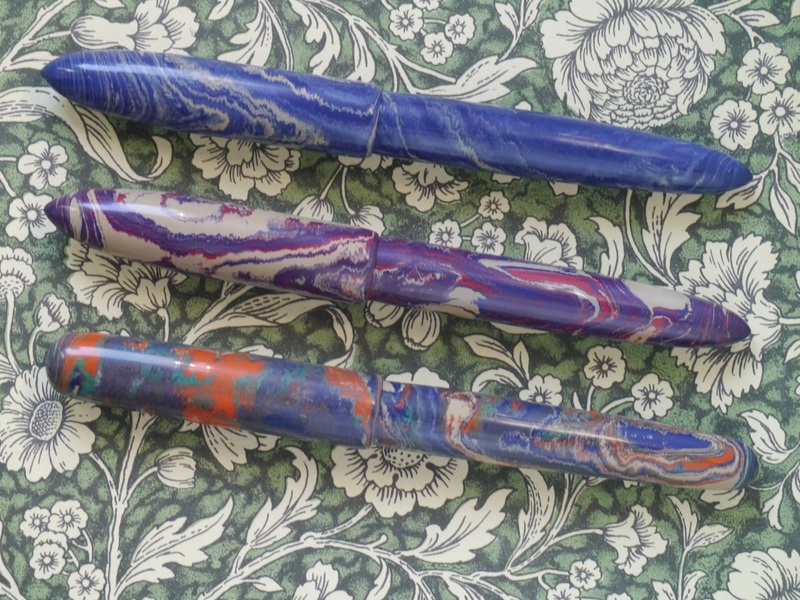 just for colour comparison, here are two model 4 in polished (blue ripple) and bakul (red/pink ripple). What I have noticed is that polished finish increases the contrasts between colours of the ripple, bakul softens it out. Both are nice finishes, bakul feels even nicer in the hand, warmer, similar to wood. Polished protects the pen slightly more from ink stains. You know I am a satisfied user of Ranga pens, but I also enjoy taking the pictures, ebonite is often not easy to photograph. Is bakul or polished more susceptible to UV degradation than the other? Forms submitted for 2 pens. not sure really, I tend to protect my ebonite pens from light, so the ones not in use are in a drawer, the ones I use are usually on my desk in horizontal position but far from direct light. Bakul tends to pick up ink stains a bit more if you do not clean it well after filling, and the section also tends slightly to discolour due to washing. It's a natural thing though, and it takes time, so even in my most used bakul pen it's only marginally visible. Much worse when you leave them exposed to light, like in a show case. I have a couple of polished ebonite pens that have lost their polish on one side due to light exposure (but I bought them like that already...). Terrific lighting and detail in the photos, sansenri. Are you using a macro lens? Yes, quite some time ago I had to move from my analog Nikon gear, which I loved. With digital I've never really re-bought all the lenses I had, I opted for a cheaper (but especially lighter! I cannot carry all that the weight anymore..) Panasonic mirror-less system, and not so long ago bought a Leica macro Elmarit 1.2 lens for it. Edited by sansenri, 17 November 2018 - 15:46. Thanks for Grand Response to this Grand Festival Group buy So Far!!! We have already crossed 100 numbers!!! Thanks for the update. Will we be getting email confirmations on them at that time? Sorry if I didn't see it but how many days to USA on these have you seen on average for your shipping method? Hi! I am just wondering if I can order some of the clear, translucent models in this group buy? Thanks! Thank you for this group buy and your diligence! 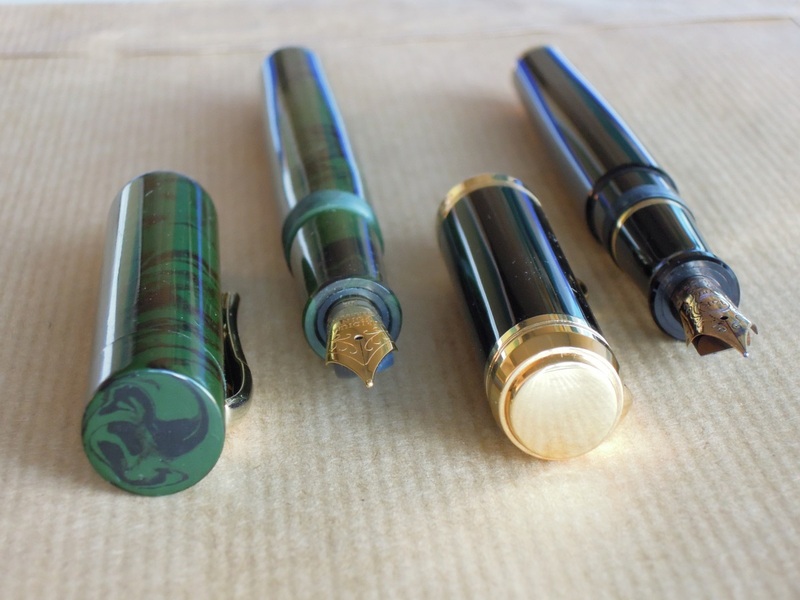 Will you be letting members know when their pens have been shipped? Although, I realize turning so many pens plus administrative work might make that difficult.